KLIR Vapor Eliquid is made by Ventura Vapor Company, and it is our second TFN eliquid review. TFN stands for Tobacco Free Nicotine. The chemical structure of TFN is identical to that of nicotine extracted from tobacco, and is colorless and tasteless. The benefit of a TFN eliquid is in its name; Tobacco Free. We’ll touch more on this below. KLIR Vapor Liquids is a “flavor” brand. That is to say that the three flavors we reviewed were designed to deliver the best flavor experience for all Vapers. As soon as we began the review period we knew these eliquids were going to focus on clean, pure flavors. They did exactly that, but in the vapor production department we were pleasantly surprised that each one was cloud producers with the right atomizer. KLIR eliquids to not contain extra sweeteners, although both their Absolute PB&J and Pure Pie were plenty sweet, but not overly so. KLIR was designed by mixologists with TFN in mind, so their flavor profiles are particularly clean and authentic. The three flavors are beautifully packaged in opaque white bottles and white boxes. They are offered in 30mL and 60mL sizes. The TFN is manufactured by nextgenerationlabs.com, while KLIR is manufactured Socal for Ventura Vapor. Ventura Vapor has designed and manufactured all of their products, including KLIR, in southern California. They are handcrafted and tested in a GMP, ISO 9 certified facility. TFN nicotine is synthesized in a laboratory without using any tobacco plants for extraction. The process of creating a synthetic nicotine is over 100 years old, but its only recently that this method has garnered a lot of attention. If it had not been for the disastrous ignorance of the FDA in their foolhardy ‘Deeming Regulations’ we would probably not see this sudden move of TFN eliquids. We don’t hold out much hope that the FDA will look at TFN eliquids any differently than it does tobacco extracted nicotine, but in a way, it doesn’t matter. If nothing else, tobacco free nicotine gets us one more move away from tobacco. If, down the road, a TFN eliquid winds up changing the current regulations you can bet that just about every brand will switch to tobacco free nicotine. The biggest reason why a Vaper might want to move to TFN eliquids is the ultra-clean taste. Nicotine extracted from tobacco plants will vary in quality, and some say that this nicotine can retain some of the plant-like taste that could require some addition of flavorings or sweeteners to make up for the quality of the nicotine. With a TFN there is no need to mask anything. Talented mixologists can focus squarely on their recipes and their skill at creating flavors without the need to ‘doctor’ up the recipe over lower quality nicotine. TFN is flavorless and it allows for more ‘delicate’ flavors or ‘complex’ flavors to truly rise to the occasion. And with a cleaner, purer flavor, there is less a need for PG-based flavoring. Mixologists can use more VG in their recipes, making for stupendous vape experiences for all sorts of atomizers, from plus-ohm, sub-ohm, and ultra-low resistance atomizers and coils. Tom – I used my VGOD Pro 150W mod and the Aspire Cleito 120. I vaped all three above 100W. Kiera – For me it was my Vaporesso Tarot Pro (yellow!) and the TFV8 Baby Beast 0.15Ω at 105W. Jason – The VGOD Pro 150W and the Freemax Starre Pure, 0.5Ω coil at 80W. The three eliquids have their individual flavors but much of the vape experience extended to all three. Flavors were robust, but definitely felt like clean flavors, never a dull, heavy, or depressed flavor component. It felt like all three shined best outdoors on a breezy day with low humidity. I know, sounds crazy right? But when I said this to the crew they all agreed, telling me that they didn’t know how to put it into words until I described the experience. Vapor production was equal throughout the three eliquids. They were better when vaped with higher wattages to produce warm vapor. However, even if the tank/coils could go much higher the flavor began to wane the higher we went. We recommend a little experimentation here to find the right “warmth” without curbing the flavor. Fresh strawberry jelly & rich smooth peanut butter filled inside creamy dough balanced to perfection. You won’t even need a glass of milk. Julia – 5 Stars– All three received 5 stars from me when it came to quality. That should not be a surprise to anyone. These are all expertly produced eliquids made in an ISO 9 lab. You can’t get better than that today. Flavor wise, this eliquid tasted just like a peanut butter and jelly sandwich on white bread, with the crust cut off. I like it, a lot, but not so much that I would add it to my daily rotation. It deserves a spot in my collection, and it has one. 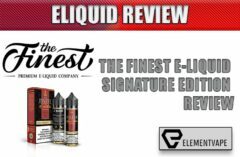 Tom – 5 Stars – You can’t argue about the quality of the eliquids in the KLIR lineup. These are all definitely high end commercial eliquids. As for the flavor, I was surprised. Yes, it tasted just like you would expect a PB&J to taste, and the clouds were plentiful, I don’t think I would vape it every day, but once a week would be fine. Vapers looking to vape a PB&J, this is it. Kiera – 5 Stars – The success of PB&J is, I believe, only possible because of the TFN. I tasted a real PB&J while vaping this one, and because the nicotine played no part in the flavor, this PB&J flavor was as authentic as you can imagine. I loved it! Jason – 5 Stars – If you want to vape a peanut butter and jelly sandwich then this is the only eliquid you need to do it. The flavor was uncanny, spooky even. The thick dense clouds this flavor produced was infused with the essence of a PB&J, and at first it was a little freaky to taste the sandwich in vapor form, soon enough I couldn’t get enough. This hit home, in a big way. Delightfully fresh tastes of honeydew melon, sweet berries, ripe mango and our signature cream base. Perfectly light, crisp and creamy. Julia – 5 Stars, certainly, but this combination of fruits in a TFN allows for each unique fruit flavor to shine out. Honeydew and blueberry, even a ripe mango, all slathered on a creamy base. Fresh and light, but that creamy base gives it body. Spectacular! Tom 4.5 Stars – With or without the creamy base of this fruity eliquid, I would give Fresh Fruit the full 5 stars. The fruit flavors shined where they were supposed to, and yet at the end of every exhale I tasted that layer of creamy goodness. I swear, this pure of flavor can only come from a zero-nic eliquid, or a TFN. That rare fruity ejuice that makes it into my rotation. Kiera – 4.5 Stars – I enjoyed vaping Fresh Fruit mainly because of the creamy base that sort of envelops each of the fruity flavors. Plenty of vapor production as well, I suppose the only reason it doesn’t get the full 5 Stars is that there is a very slight artificial taste to it. Not enough to stop me from enjoying it, but it is noticeable. Jason – 4.5 Stars – I’m not sure if it was me, or the tanks I used, or even the time of day, but I could not taste a mango flavor in this Fresh Fruit blend. Because mango is mentioned in the official description, I can’t give it the full stars. Still, I enjoyed it. Not sure I would add this to my rotation, but it deserves a place in my collection for times when I want a clean, fresh vape. Indulging fresh apple crumble pie, with the perfect balance of warm apples, sugary graham cracker crust and a dab of vanilla whipped cream. No fork necessary. Julia: 4.5 Stars – I wanted to love this Pure Pie flavor, and in some ways I did. Any vaper will taste the inside crust of the apple pie, that undercooked, light colored crust that is soaked in apple pie filling, and I loved that part of it. The reason it lost half a star is because we recently reviewed another apple pie eliquid and I went back to it to compare the two. I found them to taste very different, and I gave the edge to the other one ultimately. I think this blend has just a bit more piecrust flavor, and it overwhelms the apple flavor. Not by a lot, but when compared with the other, I couldn’t set it aside. Tom: 5 Stars – Pure Pie is exactly what this one is. If you’re looking for an Apple Pie eliquid this isn’t it. There is a big difference between an Apple Crumble pie and a straight up apple pie. With Pure Pie you will taste the piecrust, and the sweet crumble piecrust more so than with a regular apple pie blend. I preferred this unique take on apple pie. Kiera: 5 Stars – When I go to the grocery store and I see two types of apple pie; the kind with a normal piecrust and one with crumbles all over the top I always choose the crumbles. It is a sweeter apple pie, with lots of sweet pie crust, the crumbles. This is the one you would buy with Vanilla Ice Cream, so when KLIR adds that vanilla whipped cream it serves as the vanilla ice cream to me. In my rotation now. Jason: 4.75 – Pure Pie is definitely the apple pie with sugar crumbles on top. The piecrust, including the crumbly nuggets, is the biggest component of the flavor profile, and for Vapers looking for the ultimate piecrust flavor with a side of apple flavoring, this is the to look for. Why that quarter star was taken from the rating is the lack of graham cracker flavor. I wanted just a bit more than it offers. I just couldn’t taste the graham crackers at all. KLIR is a Tobacco Free Nicotine eliquid. And although this nicotine is free of flavor, it adds a clean tone to each of the flavors. In other words, none of the four were heavy, dark, or too sweet. TFN’s are the perfect nicotine for all-day-vapes, and with the right flavorings and plenty of VG, a TFN can be that all-day-every-day eliquid. For these characteristics we find KLIR to be a superb label.